I fell off the training wagon after my mountain bender last week. I've just been focusing on priorities elsewhere, but I have found time for a couple of short rides and a couple of trips to the gym. I also got out Friday for my first mountain bike ride in what feels like ages. 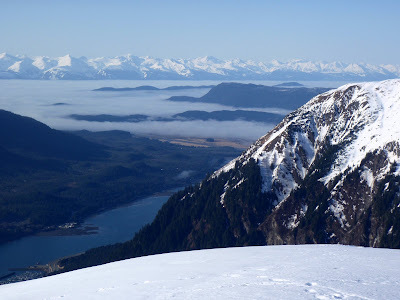 I splashed through the muddy trail system of the Mendenhall Valley beneath a thick mat of fog, craving snow. 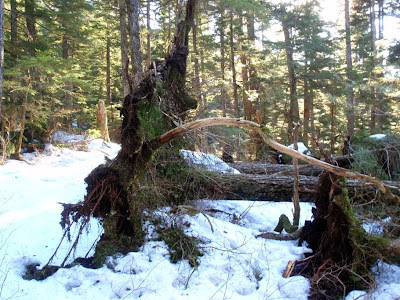 February was basically one long thaw, and Juneau's sea-level trails are nearly back to their mossy, spongy summer condition. 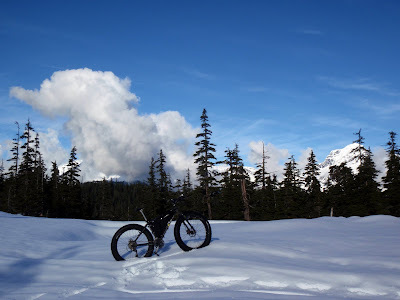 I miss snow biking. 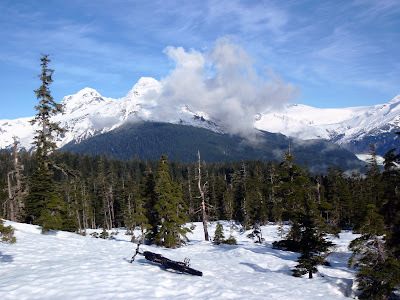 So I went home, put on my ice-cleat boots, and pushed Pugsley up the treacherously icy Lake Creek Trail, knowing I was likely to find little more than a slushy, long-faded snowmobile trail at the top. As I expected, I was able to ride for short stints in the shade, but mostly I spent the afternoon going for a long walk with my bike - which is actually great training, though not terribly fun. I did find the sun. I always enjoy the sun. I am really excited about this year's Iditarod Trail Invitational, which kicks off Sunday at 2 p.m. I participated in this event in 2008 and 2009. I finished in 2008 and later that year wrote a book about it. I dropped out last year with frostbite on my right foot. Before I even started the 2009 race, I had already decided I wouldn't participate in 2010. 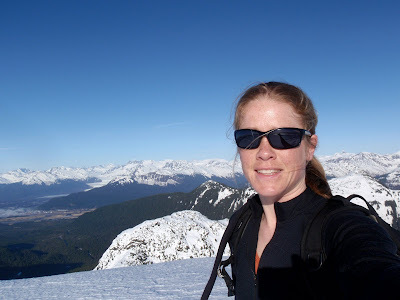 I had plans to ride the Great Divide in summer 2009, and I knew I would spend a long summer entrenched in the planning and training for that undertaking. Preparing just to survive the 350 miles to McGrath can be even more arduous and all-consuming than the Divide (in my opinion), so I figured I'd need the winter off to take a physical and mental vacation from cycling. 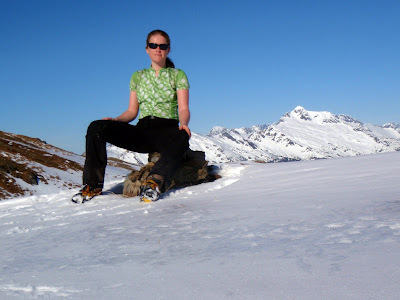 I did use my lax winter to try some new things - winter mountain trekking and to a lesser extent, skiing - but mostly I spent this winter wishing I was training for the ITI. It's such an intoxicating experience in ways I couldn't begin to explain. I've started having dreams about lining up with the group on Knik Lake. When I wake up and it's not true, I feel disappointed. So am I going back in 2011? This race fills up in like an hour these days, but you better believe I'm going to try. I excited just to spectate this year's race. It's going to be an exciting one. There are a lot of strong cyclists to watch for — Pete Basinger, Jeff Oatley, Jay and Tracey Petervary, Rocky Reifenstuhl, Louise Kobin and rookie Chris Plesko. 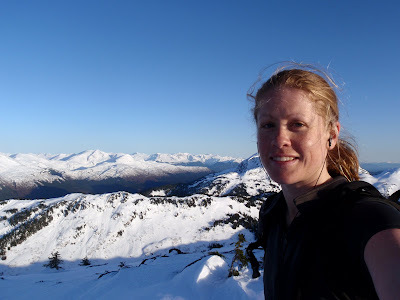 There are runners I'm cheering for too - Anne Ver Hoef, who developed painful frostbite on her face in 2008 and who I bonded with at the Hurt 100 in 2009, and Tim Hewitt, who has completed the walk to Nome and almost unthinkable four times, and who as far as I'm concerned is the patron saint of the Iditarod. He is the first person who was willing to look me in the eyes at Yentna Station last year and say, with a touching amount of empathy and understanding, "You know you can't go back out there." There's also rookie Lorie Hutchinson, who wrote me an e-mail some months back and said "Your book is the reason I entered this year." 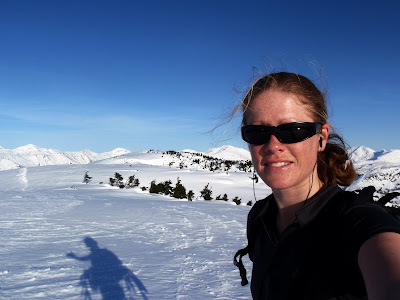 She's a runner who is riding the Iditarod on a bike. This statement alone made writing and publishing that book worth it. And there's so many other great people - Phil Hofstetter, the Nome resident who's quietly fast, and Sean Grady, the former New Jersey mountain biker who never said quit last year (even when the rough trail conditions kept him out there for 10 days.) There's Brij Potnis, the self-proclaimed (but undeniably speedy) "tourist" who toughed out minus-72-windchill at Puntilla Lake in 2007. They're all great. The community is half the reason to experience the Iditarod. I'm cheering for everyone. I'm hoping to see the strongest finish yet. Trail conditions will likely make it interesting — there's everything from fresh snow at the race start to "sidewalk" hard trail on the Yentna River to bumpy horrible trail along the Skwentna River to no snow, open water and frozen tussocks in the Dalzell Gorge and Farewell Curn. I still think there's a good chance for a record this year, which right now belongs to Pete Basinger - 3 days, 5 hours in 2007. I'm also tracking a similar and yet very different endeavor by Mike Curiak. 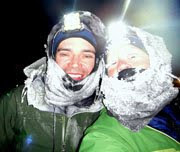 Mike's human-powered experience on the Iditarod is nearly unmatched. 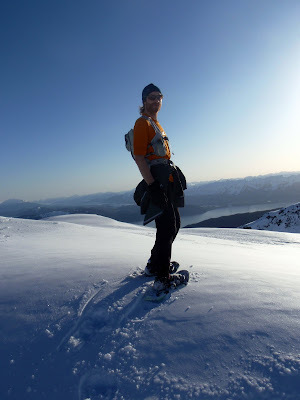 He's come to Alaska nearly every February since 1997, including his first trip to Nome way back in 2000. His statement about that trip perfectly echoes my feelings about riding to McGrath in 2008: "That trip, and the lessons it taught about my own adaptability and capabilities, remains one of the brighter defining moments of this lifetime." Mike still holds the bicycle record to Nome, which has stood since 2001. These days, Mike no longer races the Iditarod. He "tours" it — under self-imposed conditions that we "racers" can hardly even fathom. He travels under a strict self-support credo, which means for 1,100 miles of some of the harshest, most exposed conditions on Earth, he is completely self contained. He has no resupplies. He enters no buildings. He is completely, truly, in a way few modern experiences can even touch, on his own. When he starts, he is carrying 24 days worth of food and fuel, and his bicycle weighs 145 pounds. If something goes wrong — and things always go wrong — he has to deal with it himself, with no outside help, out in the elements. Interestingly, the first time I ever met Mike Curiak was when things started to go wrong for him in 2008. His tent poles broke and his stove wasn't working. He made the hard decision to stop at a house in McGrath. I had just finished my own crazy, humbling - and not even comparable - experience when I first encountered Mike standing in the front room wearing only long johns. Because all male cyclists look the same to me, whether they are wearing spandex or Arctic gear, I had no idea who he was, at first. I mumbled a generic, "So are you headed back out there?" "The future is uncertain" he replied. Later, I realized who he was. I still kick myself over not chatting with him more within the context of that truly unique circumstance. His goal is to ride all the way to Nome without breaking his self-support code. It really is quite unimaginable. But every year, I follow his SPOT tracker (his only form of communication; he carries no satellite phone), and I try to imagine what it would really be like. Which is why I was truly flattered when he contacted me this year and asked if I wanted to help Scott Morris provide color commentary for his blog. I'm really looking forward to it. I'll probably also do plenty of sportscasting on my own blog for the ITI. You can track the results of the race here. Wake up to a new day, the fifth straight of sun. I roll out of bed in the same slumping way I have for days, bracing for painful impact on my tender body. Despite four hard and physical days, my legs spring back with surprising elasticity. My back straightens and my shoulders relax. I rub my eyes; the tear salt burns in dozens of tiny cuts in my hands. The stinging sensation jolts me fully awake, with eyes open to the bright new day, and I realize that not only do I feel healthy again — I feel strong. I wasn't expecting to feel this way on the fifth straight day of sun. Bodies, like lives, can be amazingly adaptable. And, like lives, only through struggle can they really grow. I take my newly formed muscle fibers and return to Thunder Mountain. I've been wanting to go back here, and I knew the fifth day of clear weather may well be the last. A climb on Thunder Mountain is a true climb, up something only faintly resembling a route thinly notched into the steep mountainside. Hands must be applied before most steps, with fingers grasping roots and stumps to leverage a bottom-heavy body better adapted to turning pedals than swinging from trees. I press my hands into cold earth, wincing as tiny slivers of ice pierce my cuts. 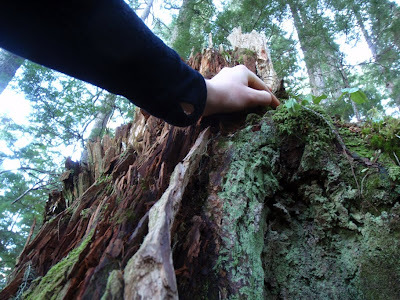 But through my fingers I feel a comforting softness — pillows of moss, tender leaves and spongy, decaying wood. I hoist my body up another step; the soft earth holds me like a bridge over a precipice. Winter hasn't been kind to Thunder Mountain, and the mountain is littered in landslides and deadfalls. 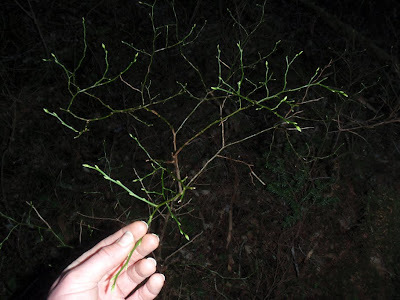 I hoist myself over the toppled trunks and wade through a morass of branches and needles. All of this decay — none of it was here four months ago. Avalanche debris is nowhere to be seen; this is simply a matter of the mountain slowly falling apart. It's a subtle reminder that one day Thunder Mountain won't be a mountain. It will be a desert, or a prairie, or the bottom of the sea. This is universal truth — entropy. Nothing stays the same. I feel this way about my life. I feel this way about my body. My molecules, my atoms, water and carbon, someday it will dissolve and it won't be me anymore. It will be a rock, or a fish, or a branch of a blueberry bush on Thunder Mountain. But for now, I am me, and the blueberry bushes are prematurely reaching for new life. It is Feb. 22 and fresh green growth is everywhere. Days on end of sun preceded by weeks on end of temperatures that hardly drop below freezing will do that. But this time, it's at least two months early. 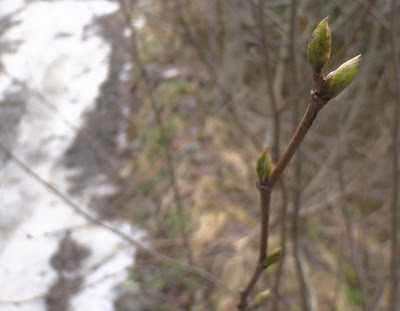 I fear for the blueberry bushes, that winter's deep freeze will return and kill them all. Or maybe it won't. 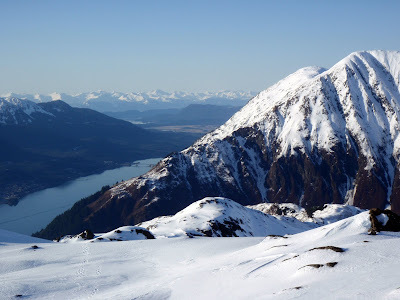 Maybe, in this ever-changing world, spring sometimes comes to Juneau, Alaska, in February. 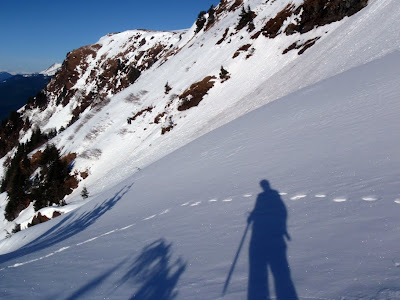 I claw up another thousand feet of slush until I reach the sun-scoured summit of Thunder Mountain. 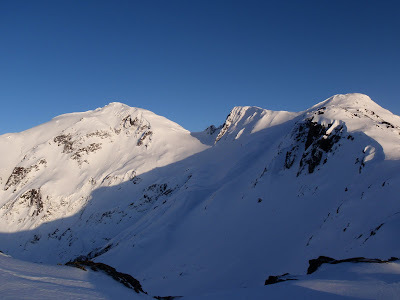 Large patches of tundra have emerged from the snow and the mountain has already put on its springtime face, which, more than any other time of year, looks like old age and decay. I am not tired and sore anymore, but neither am I elated to be here, smug and prideful at having "bagged" another mountain. I am, simply, where I am supposed to be, where I need to be, at 11:45 a.m. Feb. 22. I am forever trying to explain why I do what I do, to myself as much as anyone, to try to gain a grasp on the reasons for this unconventional lifestyle, this frivolous hobby, this roadblock to the "real" life that my culture tells me I should be living. But I can't explain it. It's just something I feel, feel as strongly as the urge to wake up in the morning or eat dinner in the evening. So you see what I do — I go to the mountains. I settle down on a rock, lingering for the few moments I have before my conventional work schedule dictates that I start back down. I don't mind this side of life — in fact, I, like anyone, thrive on the perception of structure and purpose. But I do feel that it's all perception. Our work is only as good as we believe it is. I am good at what I do, but I am easily forced into a corner. Dozens of decisions made from a distance, by people who aren't watching, slowly erode away at creativity and purpose, until we become drones, something like machines, and if we taste a little freedom, release ourselves from necessity, we are always going to ask ourselves, "why?" So you see what I do — I go to the mountains. 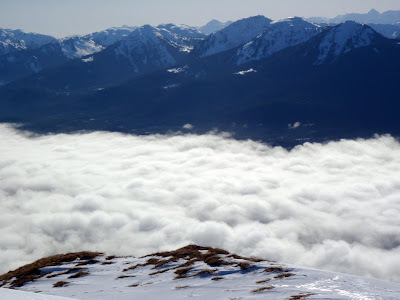 I am not trying to lift myself above it all, or escape the fog-drenched world below. I know I will always go back. But more than structure and purpose, I am in love with life, and everything life has to offer, even the pain and fatigue, the sunburns and the cuts, the anxiety and the fear. I love life with a voraciousness and hunger that can never be contained, even as I grow older, even as the spark that is me fades from my body, even as my molecules decay and disperse, even as the mountains erode and disappear, even as the sun engulfs the Earth, and the universe becomes something else entirely, this love will continue. I won't apologize for loving life. I will struggle and I will contribute and I will do the best I can, but I won't apologize. I will hunt life. I will embrace it, and I will cling to it in all of its ever-changing elusiveness, even if it slips away from me forever, even if I know it will slip away from me forever. I love life all the more because it changes. And I will recognize when I need to change, too. I know the mountains will be here. Long after I am gone, they will be here. But they won't always be here. I didn't sleep well last night because my heart rate wouldn't slow down, something that happens to me when I am "overtraining," which to me means working my body at a consistently higher rate than it is comfortable with for an extended period of time. The kind of thing I do during an ultraendurance race. The kind of thing I'm actually seeking to do right now, with my "mountain bender." But after not sleeping well, I woke up late with a sun hangover, prickly quad muscles and legs that felt like they were stapled to the mattress. My hands are torn to shreds from my Sheep Creek bushwhacking adventure and I'm finally starting to get blisters on my toes. So I decided, "time to take a rest day." I knew, physically, that rest would do me more good than exercise at this point. I did some cleaning and organizing at home, and at noon decided to go to the office a couple hours early and work on some administrative stuff that I've been putting off. 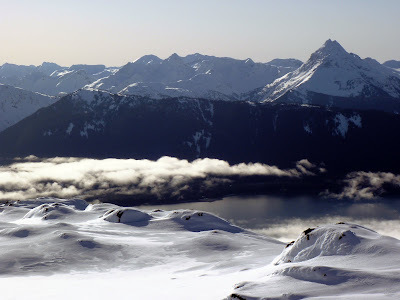 As I drove south, the mountain peaks that envelope Juneau like a fortress became visible through the diminishing fog. As though emerging from a fog myself, my inertia slowly became supplanted by desire. "I have two hours," I thought. "What can I do with two hours?" I drove past my office building and kept going. I had in my car a pair of running shoes and clothing I wear to the gym. 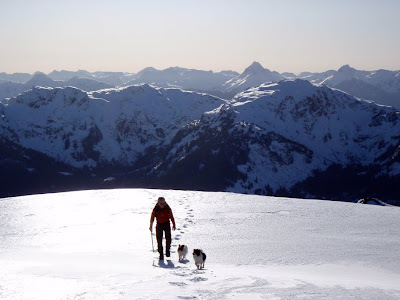 Not exactly up to the standards of the winter trekking gear I traditionally use, but perfectly adequate for what I had in mind - climbing to Ben Stewart, a 3,366-foot-high peak on Douglas Island. 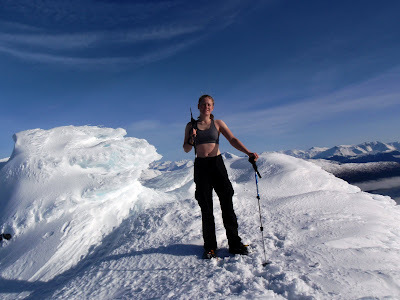 I have actually never been all the way to this peak before, because it's a muskeg-slicked slog in the summer and in the winter it is usually the realm of skiers - located in the immediate backcountry of Eaglecrest Ski Area. 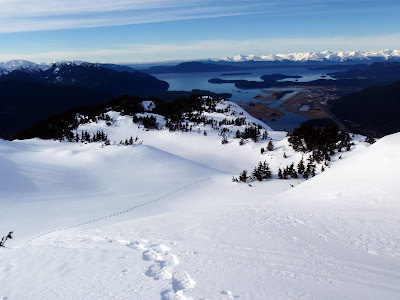 But it's a good, fast peak to hike for two reasons - you can "cheat" by starting at the base of the ski area at 1,150 feet rather than the typical Juneau starting point of sea level. And snowshoeing snowboarders generally lay a good boot-pack trail that is sufficient for running. 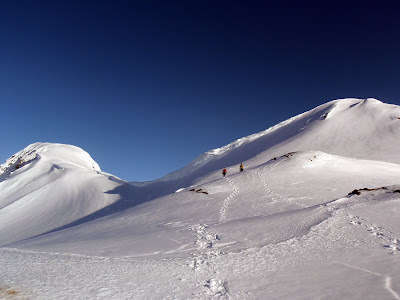 But as I tried to kick-start my reluctant legs and adjust my sunburned eyes to the bright white snow, that nagging guilt, "why are you doing this?" trickled into my mind. So I thought about it. I coughed and clawed up the slush and ice and thought about it. I didn't think very hard, because mountain benders combined with my weekend work duties generally turn my mind to mush. 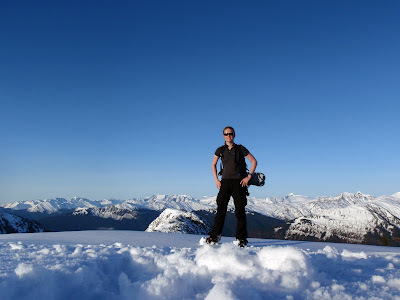 But the only answer I could come up with, as I stood on the peak with the sun-drenched pinnacles of Southeast Alaska surrounding me, was, "It makes me happy." But that started me thinking about the substance of happiness. To me, the question "what is happiness?" is the same as asking "what is food?" It is something that fills you up, energizes and replenishes your body and mind. It is something you need and something you seek after. It is not the same for everyone - some people crave lobster; others like peanut butter sandwiches. Happiness is organic in the same way food is, consumable and finite. One source will never be enough to satiate a person forever. We are destined to pursue it our entire lives, and eventually find fulfillment in the pursuit as much as the reward. The question "are you happy?" is the same as the question "are you hungry?" Happiness is hunger, the force and motivation of life. If I'm satisfied today, I'll still have to go searching the next day, and the next and the next, until I breathe my dying breath. And to stop searching is to starve, slowly but surely. This I believe. The high-pressure system continues. I did an ambitious trek up Gold Ridge today. 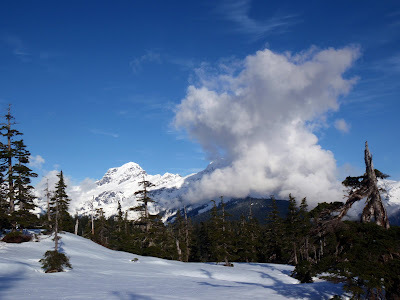 There were nice, packed footprints in the snow; I jogged and power-hiked most of the way up and ran, loped and hobbled on the way down. The reason I pushed it so hard is because I didn't get started until nearly noon, and I had to be to work before 3:30. The reason I didn't get started until nearly noon is because I couldn't pull myself out of bed in the morning. The reason I couldn't pull myself out of bed is because I felt sore and hung-over and generally crappy from a 13-plus-hour weekend of hard labor in the hot sun. But eventually I dragged myself toward my coffee maker, gulped an entire pot of rocket fuel, and rallied. "Why bother?" you might ask. "What's the point?" you might ask. I have my reasons. Even as these mountain benders rip up my body and burn my eyes, the experience of being immersed in the fog of it, drunk on endorphins and awestruck at the scope and beauty of the world, is a healing experience. It gives me clarity and hope. The reason I do it - the same reason some meditate, the same reason others dance or paint or pray. It's my way of feeling wholly connected, creative, energized and alive. On a place like Gold Ridge, I see others, just as awestruck, just as invigorated, and I know I'm not alone in this. But, like all things in the universe, every reward comes with a cost. And like every bender, every mountain binge comes with a hangover. And like every hangover, the only cure is to get right back out there. Only time for another quick photo post today. But what a stellar weekend this was! Today I lazed through a relaxing morning, and in the early afternoon I headed up the Hawthorne Ridge with Geoff (yes, my ex) and Dan. This was unique for a couple of reasons: 1. I can never talk people into hiking with me on Fridays. Dan actually took the afternoon off. 2. This is a ridge near town that I haven't been to yet. Let the adventure begin. It was a simple grunt up to timberline and incredible views almost from the get-go. 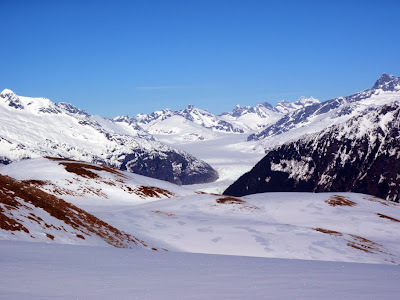 The day was so clear that we could see all the way across the Juneau Icefield. 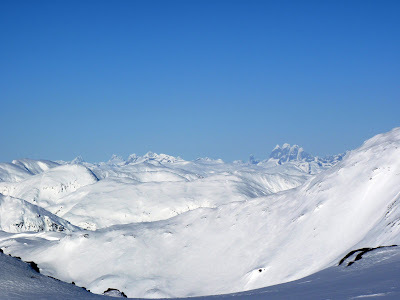 The peak on the right, the one that looks like a big hand signaling "stop," is the Devil's Paw, on the Canadian border. That's Mount Roberts, looking rather gnarly on its south side. Friday was again incredibly warm, probably near 50 degrees. 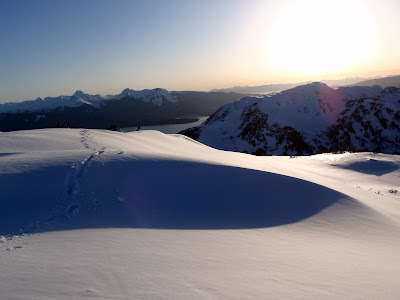 Because Juneau ridges are usually snow-covered well into July, this was nearly identical to a summer stroll - wind crust, slush and an almost unbearable barrage of snow-reflected sunlight. 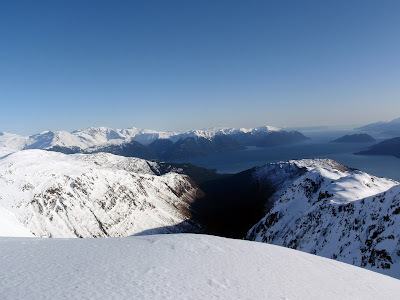 Taku Inlet as seen from West Peak. We climbed up to Middle Peak only to meet the Impassable Precipice of Death. It was a near-vertical drop down a cliff band into a razor-sharp, rocky knife ridge. This is a picture of Geoff and Dan being disappointed that we couldn't go to Hawthorne and loop around Powerline Ridge. I have to admit I was a little relieved, because my comfort threshold is quite a bit lower than these guys', and I could have easily been dragged into something nauseatingly unnerving if the route had been marginally passable, as I was suspected it would be at best after looking at it from below. The Impassable Precipice of Death left no lingering questions. Here I am standing near the Impassable Precipice of Death. That was as close as I was willing to get to the edge. Views were still good from Middle Peak, elevation 3,722. These boys have a running habit that is tough to match. Looking back over the climb up West Peak. 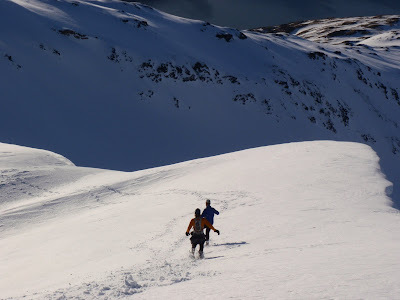 After much deliberation about the snowpack and spring-like conditions, the boys decided that instead of climbing the peak again, we would go OVER the cornice, into the steep bowl, and back out the other side. 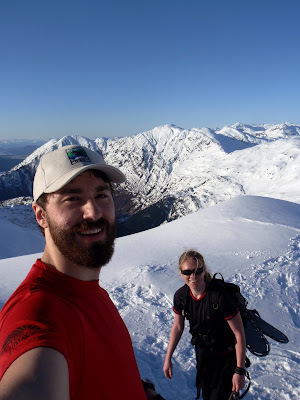 Dan's fairly experienced with winter travel and I trust his judgement for the most part, and it is good for me to push my comfort limits if I ever want to take this mountaineering thing to the next level, but, man, I was sweating the whole time. And not because it was hot. 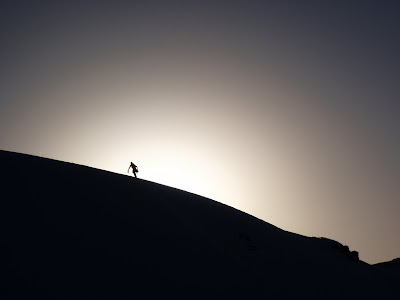 The specter of the snowshoer. Such is adventure. The biggest challenges happen after you think you're done. 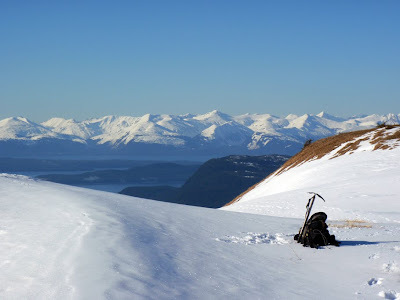 Today I did something that I have always wanted to do, which is connect two prominent peaks on Douglas Island via the mountain ridge. In doing so, I walked from downtown Douglas to Eaglecrest Ski Area, the hard way. I will eventually talk more about observations regarding yesterday's post, but for today I am just doing a quick photo blog. 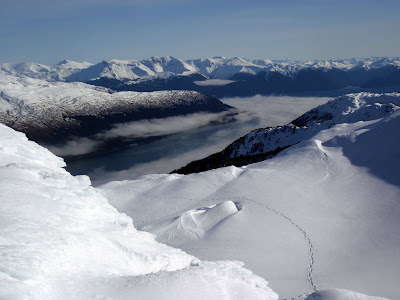 An inversion coated Juneau with thick fog during the morning and part of the early afternoon. 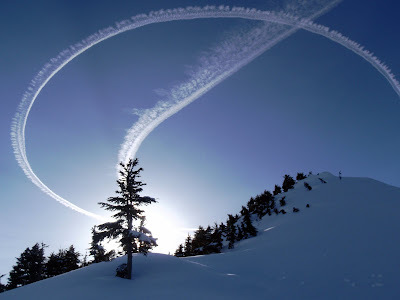 This airplane was flying in circles, waiting for the fog to clear so it could land at the airport. You have to think those passengers are grumbling about the unfairness of a weather delay as they coast through clear blue sky. And it was hot! So, so hot. I don't know how hot it was. 80 degrees? Maybe 90? It was actually 34 degrees at my house before I left for the morning. 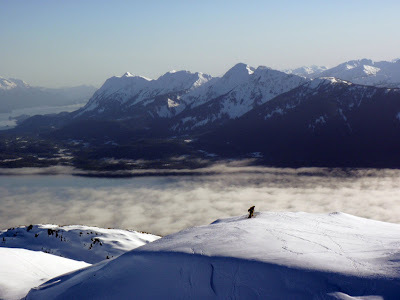 Probably mid-40s above the inversion. My shirt became drenched with sweat on the way up Jumbo so I took it off for a while, until my pasty white belly started to burn. This is the obligatory self portrait on top of Mount Jumbo, elevation 3,337. I've hiked this peak many times during the summer, and it felt every bit as warm today. You'd never know it wasn't July. Seriously. Except for all the snow and rime ice. After that, it was time to set out toward unknown territory. 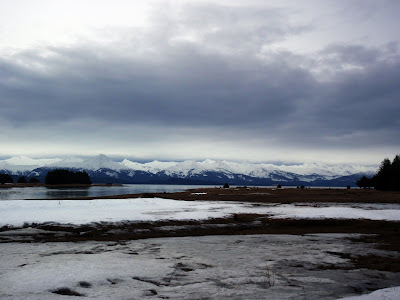 This is an overlook of Stephens Passage and Eagle Peak on Admiralty Island. 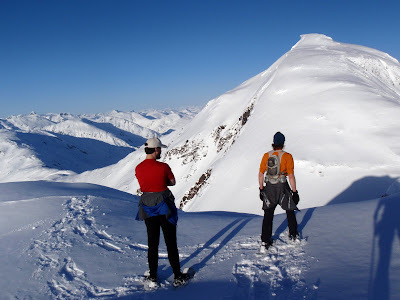 Douglas Island Ridge is fairly broad, which allows non-technical passage but can make route finding more difficult. And there was lots of route finding to do beyond Mount Jumbo. I was hoping I would see old ski tracks I could follow, but no dice. They probably melted. 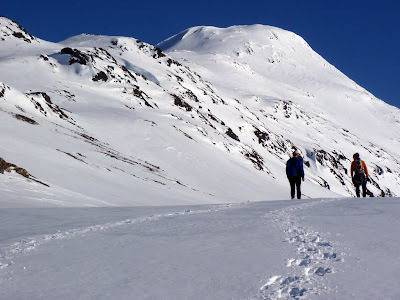 Looking back on Mount Jumbo after looping around a small secondary peak, elevation 2,800. Self portrait on top of an unnamed prominent peak, elevation 2,900, above the Dan Moller bowl. Ah, look, it's downtown Juneau. 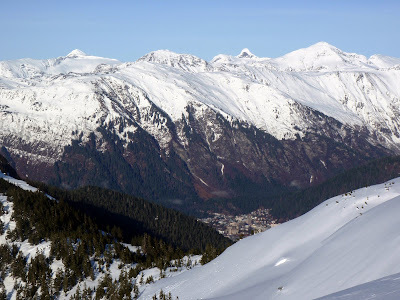 Above town you can see how high snowline is on Mount Juneau. All joy about July-in-February weather aside, it's sad to see our snowpack this dessicated. Yeah! Made it to Mount Troy, elevation 2,950. 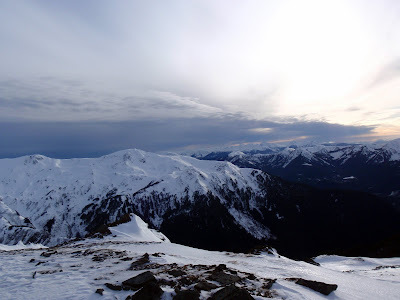 Lots of climbing to reach these high points - the ridge dipped as low as 1,800 feet at times. I had originally thought Ben Stuart might be an good, ambitious goal if the trek went really well, but it took too much time and energy to reach Troy. I'm not sure how I feel about trekking through the ski area anyway. 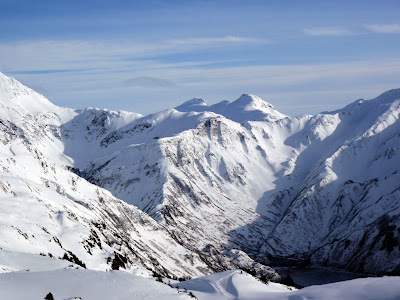 But my next goal is to link up Mount Meek and Ben Stuart. Lots of good thinking today, as well. I am very pleased with how the day went ... good goals, good introspection, good weather, good scenery, good workout. Good day. So today I'm going to post about two things that I don't talk about very often on my blog - writing and discontent. I feel like I have to preface this post because I'm not going to talk about bicycle riding, trekking or training today. It's actually still somewhat humorous to me that for the past four-plus years, I have been updating what is essentially a bicycle and photo blog. 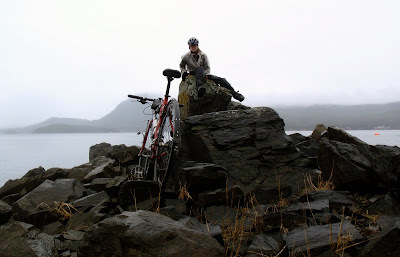 I found out recently that "Up in Alaska" was nominated for a "Best Sports Blog" Bloggie for the third time (I found out too late to solicit votes, but that's OK, because I didn't stand a chance of winning against Fat Cyclist and BikeSnobNYC anyway.) But, yeah, I have a sports blog. This idea still makes me giggle. And photography! 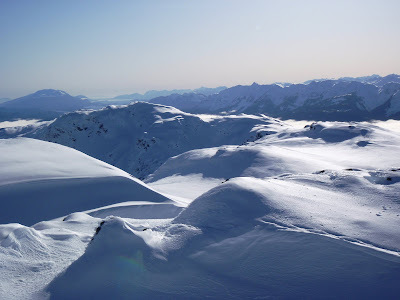 I was essentially anti-photograph four and a half years ago, the kind of person who put her hand in front of her face when cameras came out and had only recently acquired a 2-megapixel Fuji digital camera because I was moving to Alaska and "you have to take photos of Alaska." No, if you asked me on Nov. 3, 2005, what I wanted to do with a personal blog, I would have said that I wanted to be a writer, without the drudgery of actually pursuing a career in writing. Fast-forward four and a half years. Now I have a sports and photo blog with more than 1,000 posts and I spend some of my free time writing creative nonfiction that I develop in the form of books. Right now I'm in the process of finishing up the "2009 story." I've been polishing up the chapters I've written and for the most part I'm pretty happy with them - even the stuff I wrote while I had the flu, when I managed to evoke more than a few, ah, interesting metaphors (chalk that one up to Nyquil.) I really only have one more chapter to actually write, and I've been avoiding it. I pretty much know exactly what I want to do with this chapter; the reason I've avoided writing it is because I don't want this project to end. Oh sure, there's still tons of editing to do, and that horrible, laborious process of trying to get the thing published (I still haven't decided whether or not I'm going to try, to be honest.) But once Chapter 24 is actually written, that's it. The creative development that has provided me so much satisfaction will be done. There won't be any more opportunities to wholly immerse myself in words and images and shimmering pieces of the past until the present me, the one sprawled out on a bed in a dark little room in Fritz Cove, doesn't even exist anymore. And this is the part where I want to talk about discontent. A vague restlessness has been needling at my senses ever since I stepped off the ferry on July 16 to rebuild my life in Juneau. This restlessness has been pronounced enough that I haven't tried very hard to actually rebuild my life here. I lived fully homeless until I finally rented my own room in mid-September (not an apartment, a room.) I've pushed away from or been unceremoniously pushed out of every new relationship I started. I won't even buy myself new hiking shoes or a trekking backpack - things I really, really need - because some mental block is preventing me from "accumulating stuff." And I have been surviving rather than thriving at work - mostly because I work at a newspaper in a bad economy; surviving is the most we can do. Meanwhile, I keep trying to do the things I love. I go to the mountains. I ride my bike. On rare nights off work, I go to parties and see movies. Life is still very good, very beautiful and very blessed. But something is missing. Something is definitely missing. I don't know what it is. If I was looking for an, ah, interesting metaphor, I would say that my life is like a half-eaten grapefruit. On the surface it's still whole and dimpled and delicious, but I've already mined the juicy center and what I have left on the inside is somewhat ... hollow. I am happy when I'm in the mountains. I am happy when I ride my bicycle. I am happy in the company of friends. But if someone were to ask me that ever-vague question, "Are you happy?," my honest answer would be "no." And I am blogging about this now just because it feels cathartic to admit it. I'm not necessarily looking for life coaching, although I always enjoy the random life-coach advice I receive (unsolicited comments are definitely the best part about keeping a blog, even if it can't be an "Award-Winning Blog" because it always gets stuck in the dang Sports Blog category.) But it is becoming obvious to me that I need to do something different. Make some kind of change. As they say, "If you do what you've always done, you'll get what you've always got." I don't know what the solutions might be. They're as distant and daunting as the Great Divide, as close and uncomfortable as the prospect of finishing my book. My plan is to spend a lot of time in the mountains this weekend, thinking about it. I'm going to think about it. "Greetings from the weather capital of the world. Phil is resting and getting ready for mating season now that his big prediction is over, but fear not. Groundhog Day is about the coming of spring, about frivolity, about curing cabin fever ( and my guess is that you and your neighbors understand cabin fever) All that being said, spring is coming… granted we may have a bit more snow, a bit more cold and a bit more wind, but alas it will come followed by summer and fall and winter again and then again next year Phil will predict the weather for the world for the 125th year. So until then Warm regards on a cold day…..
And please note, we are only 2 weeks in to Phil's prediction of 6 more weeks of winter weather….."
'Nuff said! Enjoy winter down there! Details: Another tempo ride, with three intervals until my right knee started to ache a bit; intensity 60-95 percent. Details: Blackerby Ridge walk; intensity 20-90 percent. I tried to figure out what kind of animal made these tracks. 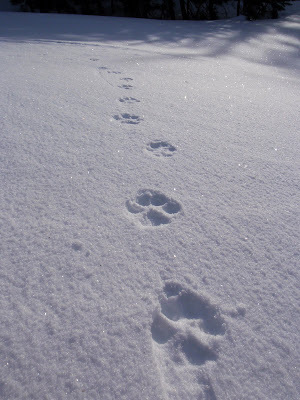 They looked more feline than canine - maybe a lynx? And the requisite snowshoe track shot. The brown spot in the upper right is the Juneau International Airport. 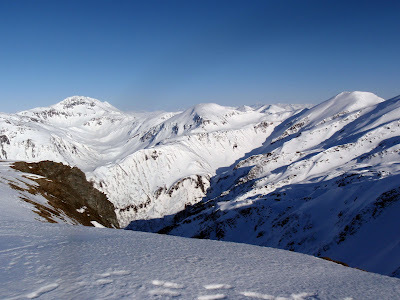 The view of Blackerby Ridge from the far end. It doesn't look like that long of a ridge, but it always takes me a surprising amount of time to reach Cairn Peak, the high point in the center - or in the case of today, the knife ridge just below the peak. Looking out over Salmon Creek reservoir. 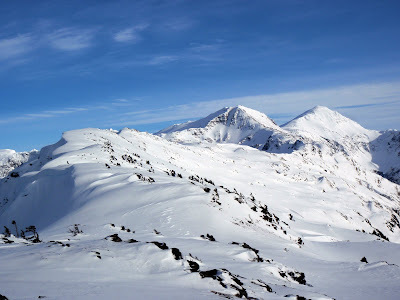 Usually this is a great bowl for skiers, but probably not during this low-snow year. 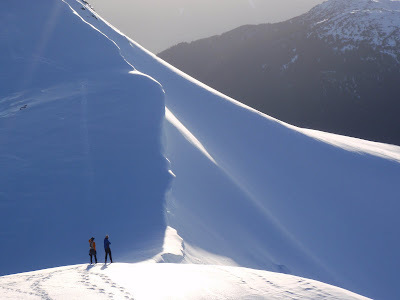 The entire ridge was lined with incredible cornices. The one near the top of this photo overhung by at least 30 feet. 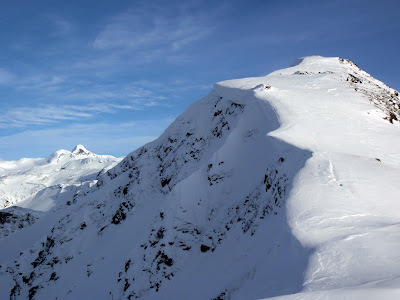 And you can see in the center right where the entire cornice is starting to crack off the ridge. I made a concentrated effort to keep my feet on top of rocks. 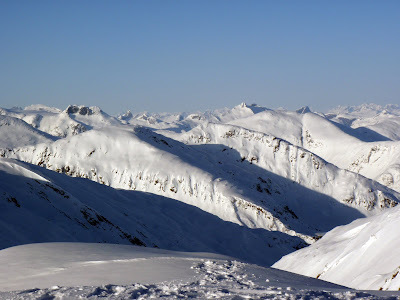 The cornices continued to the point where the ridge narrows, giving literal meaning to the term "knife ridge." I spent about 30 minutes working on this particular spot, punching my way up one side, feeling queasy, backstepping down, trying the other side, etc. The snow was fairly well packed and the angle was never more than 45 degrees, but eventually I'd hit a crux where I had no choice but to side-step along the edge of the cornice with scary exposure on both sides. I just don't deal well with scary exposure. 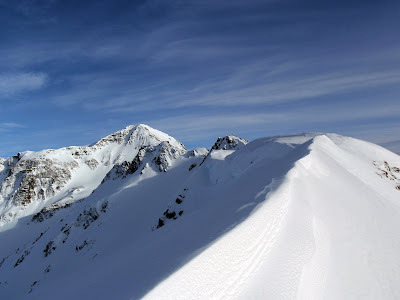 But as I analyzed the traverse, I started to become more confident in both the stability of the cornice and my ability to skirt along the top without falling. 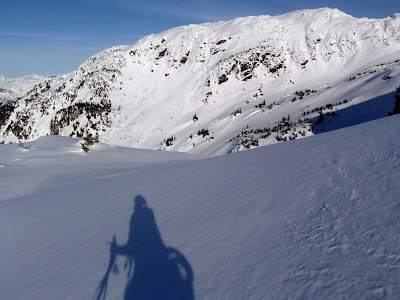 As I was reaching these conclusions from a perch on a spot that was not nearly as exposed, I took a careless step backward, missed the snow-step I was aiming for entirely, and slipped. 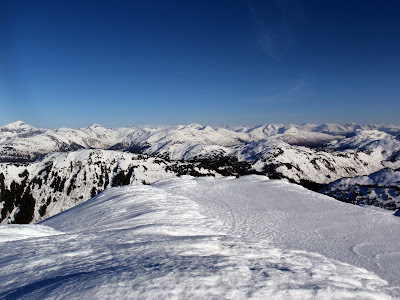 Even on a 45-degree slope, I plunged downward with surprising speed and lack of control. 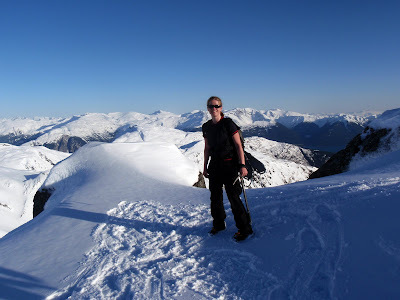 I was quickly stopped by the ice ax I had stabbed into the top of the cornice, so there was never any danger. 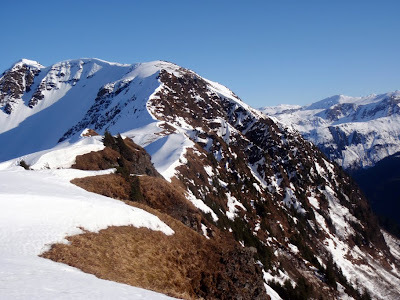 But it was such a strange sensation - the only thing anchoring me to the mountain was five fingers wrapped around an ax, while my body just dangled like a windsock over a precipice. Had I continued to fall, I probably would have slid about 100 feet into a bowl - certainly not a catastrophic fall. 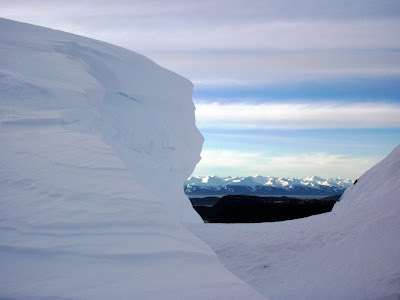 But a similar fall on the exposed section of the cornice would be a different story. It was enough to make me lose my nerve entirely. So, like I usually do, I turned around. All is OK, though. I'm really not up here to bag peaks. I'm here to absorb beauty. Oh, and beat up my poor body. I got lost on the way down. 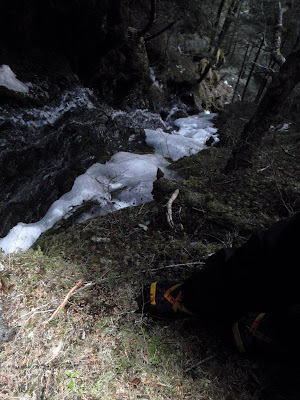 I had left the crampons on to deal with the steep ice patches at snowline, but it turns out they're mighty helpful when trying to crawl out of a partially frozen waterfall. You learn something new every day! I don't mind learning the slow way.